You’ve gone through your yarn stash. You’ve sorted through all your patterns. You knew today was coming. 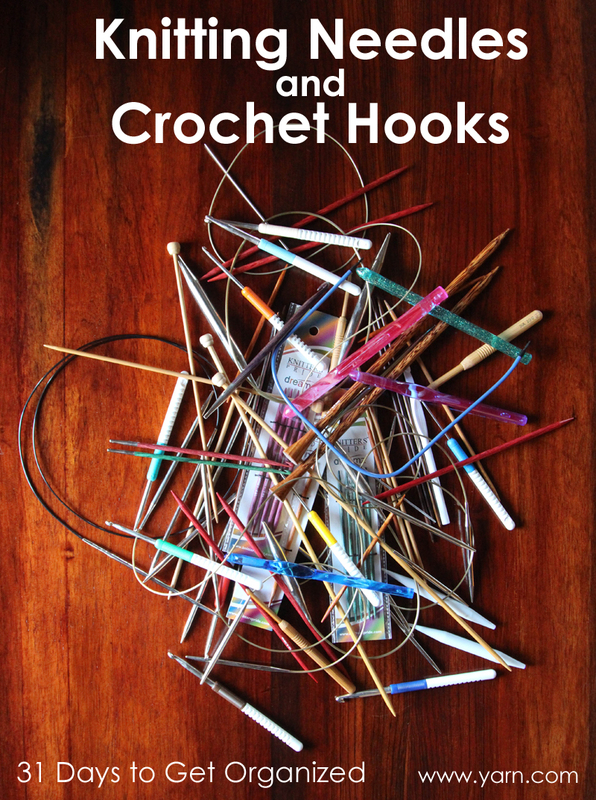 It’s time to collect all of your knitting needles and crochet hooks. If you already removed a lot of your needles and hooks from your WIPs, you’re ahead of the game today. So grab as many of your knitting needles and crochet hooks that you can. Some are in active projects, and they can stay there. With your whole collection of knitting needles and hooks in front of you, start sorting them by type. Maybe you’ll have piles for your hooks, afghan hooks, tunisian hooks, double pointed needles, straight needles, fixed circular needles, and interchangeable needles and hooks. As you’re sorting your collection into piles, notice which needles and hooks you never use. Maybe they’re too blunt or too sharp. Do you hate the join of a particular circular knitting needle? Maybe you don’t like the shape of a certain type of hook. Since part of the reason you knit and crochet is probably for enjoyment, if a certain needle or hook bugs you, get rid of it. There are so many options out there; find the tool you like to use. It’s worth it in the long run. Grab all of the needles and hooks you don’t want to keep, stick them in a bag, and bring them to your next yarn swap. You won’t miss them. Trust me. Look at the piles that remains. Now that you’ve rounded up all of your hooks and needles, do you notice a lot of duplicates? It’s ok to have duplicates, especially with knitting needles. 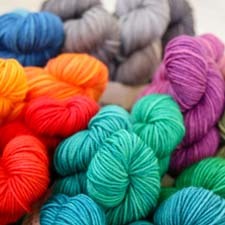 There are some techniques such as three needle bind-off, a provisional cast-on, or knitting socks on two circular needles where you need multiple needles of the same size. And you might love knitting with worsted weight yarn and find that you have multiple projects going at the same time using the same needle size. Then it’s great to have multiple needles of the same size. But if you see that you have five 24″ US 7 knitting needles, you might start to ask yourself if you need so many duplicates. Tomorrow, Grace will be showing us different tips on how to store our knitting needles and crochet hooks. Stay tuned! What’s the current state of your needle and hook collection? Do you need a little help? This entry was posted on Monday, January 21st, 2013 at 8:22 pm	and is filed under Tips & Techniques. You can follow any responses to this entry through the RSS 2.0 feed. You can skip to the end and leave a response. Pinging is currently not allowed. I’d love to have a way to store multiple circular needles. I have a Della Q bag which ties but needles still fall out of it. I’d like something that works better. My fixed circs and dpns are in a bait bag from Bass pro shop. My Knitter’s Pride needles are in a case made from a Vera Bradley paperback book cover. http://chrisknits.wordpress.com/2012/12/20/oh-the-wind/ It is handy, small, and fits all I need, except for the US13 needles. They are just a mite too long to fit in the case. But I rarely need them at the drop of a hat, so I store them in the bait bag. As it is, I really don’t need the fixed circs anymore. Just for the sizes under US4. They have options for DPNs, too, that I love just as much. My straight needles are all in a pretty vase on my dresser – I think my needles are just as beautiful as the vase itself! This is exactly how I store my dpns! I got 2 strips of fabric about 20 inches by 5 inches, sewed down the sides and turned them inside out. I sewed white tape down the middle of one of the strips. Then I put the 2 strips together, tape side out and sewed across the tape in 1 inch spaces. There is plenty of room to write the needle size on tape between stitches and plenty of room to slide all my multiples in the 1 inch spaces because only the nylon centres rest behind the tape. I sewed a loop on the top and hang it on a nail. It takes no space and looks fabulous and funky.